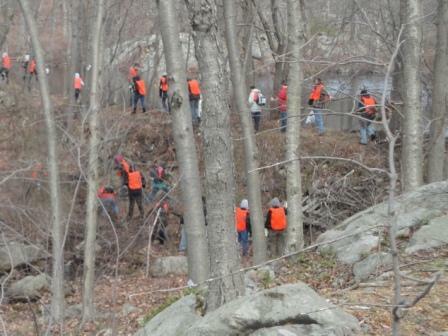 About 60 volunteers and staff members from the New Jersey Conservation Foundation conducted a deer drive at the Apshawa Preserve on Sunday, December 5, moving white-tail deer out of a 300-acre area that has been fenced to promote regeneration and reforestation of the forest. Walking slowly on foot over steep and rugged terrain, the volunteers – many of them college students majoring in environmental studies – quietly herded deer toward openings in the wire fence that were later sealed. In the process, organizers conducted an informal deer “census” which showed that the deer population in the area has increased beyond levels that allow the forest to regenerate. The purpose of the deer “exclosure” is to allow native plants to recover, and the forest understory to return, which creates a better habitat for other mammals, birds, reptiles and insects. “When there is an overpopulation of browsing deer, it negatively affects every other wildlife species in the forest,” noted DeVito. For example, forests that are severely affected by deer browse may have large trees but no understory of saplings and bushes that provide cover for birds and small mammals. While volunteers fanned out on foot to drive deer toward temporary fence openings, New Jersey Conservation Foundation Executive Director Michele Byers and Pequannock River Coalition Executive Director Ross Kushner spoke with community members about plans to make it easier for other wildlife to get into and out of the exclosure. The fence was installed this fall using a $125,000 grant from the National Forest Foundation. The grant paid for 3.2 linear miles of wire fence, removal of invasive plants like Japanese barberry and Oriental bittersweet, and the planting of native trees and bushes like oaks, maples, spicebush and viburnum. The project also included nine pedestrian gates along the perimeter of the fence to encourage public access to the preserve’s trails. The 576-acre Apshawa Preserve is jointly owned by Passaic County and New Jersey Conservation Foundation, and is managed by New Jersey Conservation Foundation for passive recreation and natural resource protection. Within the preserve, the 40-acre Butler Reservoir is a scenic attraction for hikers and birdwatchers. The Apshawa Brook flows through the preserve to the Pequannock River. Nearly seven miles of blazed trails traverse the mountainous preserve and are open to the public for hiking, bicycling, horseback riding and nature study. New Jersey Conservation Foundation, which is celebrating its 50th anniversary this year, is a private nonprofit whose mission is to preserve land and natural resources throughout New Jersey for the benefit of all. Since 1960, the Foundation has protected more than 120,000 acres, or 187 square miles. For more information on programs and preserves, click here or call 1-888-LAND-SAVE (1-888-526-3728).